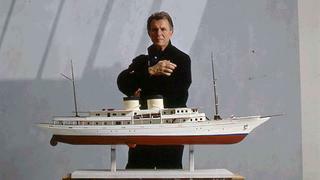 Jon Bannenbergs work has influenced many of the worlds top yacht designers  including those who he trained. Evan K Marshall’s tongue-in-cheek epitaph neatly encapsulates Jon Bannenberg’s achievement of virtually creating the notion of a yacht designer as distinct from a naval architect or an interior decorator. He was a man of extraordinary enthusiasm who launched himself into projects of ever-increasing size and complexity with complete aplomb. 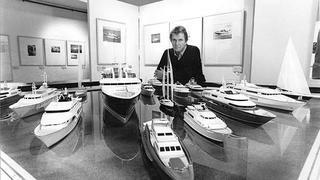 Apart from the vast fleet of yachts that is instantly recognisable as Bannenberg’s, his greatest memorial lies in the large number of leading designers who worked with him and went on to set up their own studios: Disdale, Starkey, Winch, Heywood, Poulias and others who in their turn have hired more bright young designers who have since set up on their own. Talented in an amazing variety of ways, Bannenberg trained as a pianist in his native Australia and played in London pubs when he first arrived in Britain. A job with an antique dealer led to him redesigning the shop, and within a short time he had transformed into an interior designer. As a rising star of contemporary design, he was asked to create a two-storey lounge for the QE2 – it featured a spectacular semicircular staircase with curved glass sides – and then, almost by chance, a client asked him to look at plans for the interior of a sailing yacht he was having built. Bannenberg told him bluntly that he thought it ‘quite horrible’ and offered to produce something much better. Launched in 1968,_ Tiawana_ proved to be the first of a steady stream of yacht commissions that came his way during the following 30 years. Bannenberg was skilled at quick and beguiling freehand sketches and would dazzle prospective clients by dashing off an exciting profile, surrounded by details, on the back of a restaurant menu. He also impressed on clients his need for a free hand to specify virtually every feature of a yacht down to the teaspoons. When the Getty family retained him for the total reconstruction of Talitha G, for instance, they gave him their complete confidence and went aboard for the first time when the job was complete. When Jon Bannenberg died unexpectedly in 2002, his company staggered under the blow, but a very determined effort by his son, Dickie, to revive it has proved successful. The Bannenberg studio is once again one of the major players in the superyacht industry.